For reasons that escape me, I sold the first CW9 I bought. I probably thought I liked the Shield better and didn't need it, but I have since been enlightened. Picked up my new CW9 today and cleaned it inside and out, put an inner tube on the grip, and it's ready to try out. Hopefully tomorrow. I have three 7-round mags including the one that came with it, but only 1 steel base plate which is currently on my CM9 magazine. I really want more steel base plates. 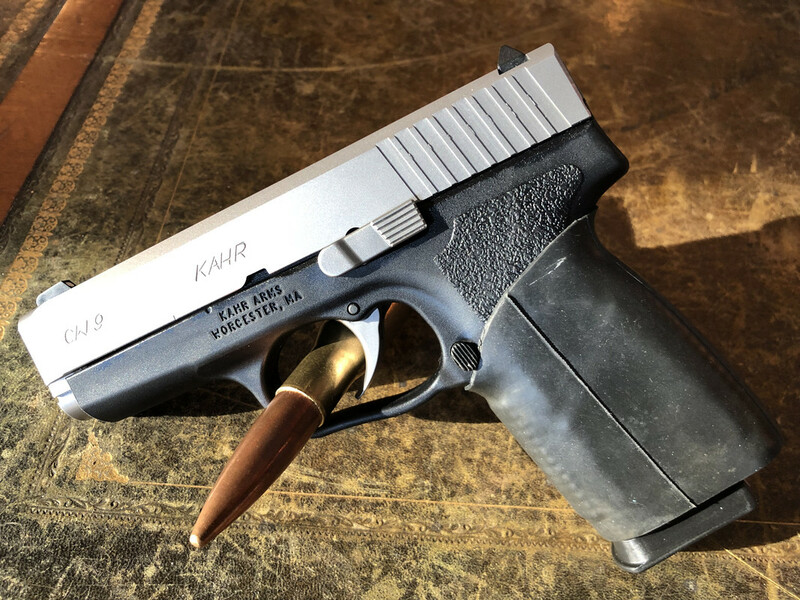 Kahr's website shows some black painted decorated base plates, about $14 each, and one with an American flag engraved for about double that amount. What's the prognosis on getting the plain unpainted metal base plates? Oh, and I'm trying to go online for the February rebate but the website keeps saying "Store is currently unavailable, please try again in a few minutes." I’ve also ground off the lip of the plastic base. I also have a Shield and actually shoot it a little better than my P9 but I just like the P9 better! Ground the lip off the base plate and added a Tuff1 grip to it. The Tuff1 is similar to a bike tube but is made of silicon and is grippier. 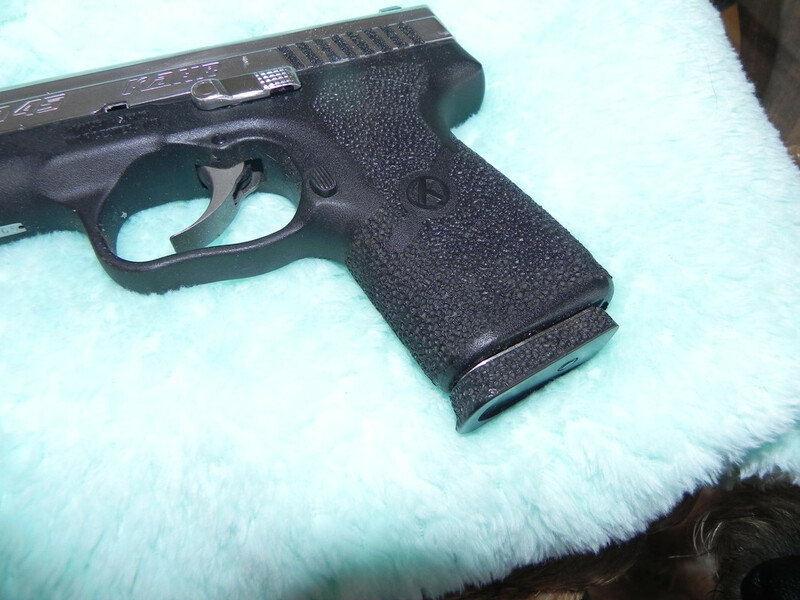 That’s a cool looking grip, looks like gator hide. Here was my solution to the innertube. I used one for a long time but while it worked I never cared for it. About 15 minutes with a wood burner and got just the right texture. Back strap not as rough but more uniform all around. Also my melted down slide stop that I went a little far on. Checkered it (poorly) and rounded things off. I put a new one on since. I'll do better next time. The break-in is done. In 200 rounds of WWB, there were some bobbles at first, like failures to eject and feed. After about 30-40 rounds that smoothed out except for the 8-round mag I brought along. I may be squeezing that mag with my pinky, making it feed wrong, but it's been troublesome in all the Kahrs I've had. After the 200 rounds I tried Hornady Critical Defense with no issues, then some S&B FMJ with no issues. About 220 rounds of satisfaction. And it could shoot a ragged hole when I tried hard enough. A real pleasure to shoot, with an ideal trigger. Now I want a CW9 again. Traded mine for a CM9 when they came out and I still have it. I did pick up a CT9 on sale a couple of years ago for about $300 and my daughter took it. Nice pistol by the way and flawless. Since then I’ve picked up a S&W shield with one 7 and two 8 round mags and a Walther PPS M2 with 6 and 7 round mags both for less than $300 each. So do I really need another 7 rounder? Since when has need played any decision making part in a firearm purchase??? NEVER SINCE THE YEAR 2010 and even before. By the way that stippling job looks good. Ha! I’m sure most wives would agree.